"...A bona fide born-in-Chicago international hit, this simultaneously nostalgic and satirical comedy by Vicki Quade and Maripat Donovan concerns a nun instructing her students—that's you—on the dos and don'ts of dogma." "...Directors Marc Silva and Vince Cracht have built a lived-in Sunday-school classroom world, virtually unchanged since this production premiered in 1993. Why toy with what works for countless droves of good Catholics, their great-aunties and in-laws? 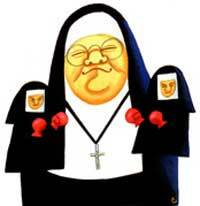 Late Nite Catechism is a nice, harmless night out-and it benefits real retired nuns, to boot." "...Between teaching hilarious new prayers (“Hail Mary, full of Grace, help me find a parking space”), reminiscing about Catholic school, and raising funds for sisters in need, it’s not hard to see why the show is such a success." "...Climbing the industrial strength stairs (an elevator is available) to the third floor of the Royal George Theater, walking down the long corridor illuminated with religious paraphernalia and show reviews-all prepare you to enter the classroom of "Sister" Mary Zentmyer, complete with the cursive alphabet wall border, chalk boards, old wooden three-drawer desk, lectern, and junior chair. Religious music sets the mood of nostalgia, whether for Gregorian chant or the remains of a hootenanny mass. Welcome to LATE NITE CATECHISM."